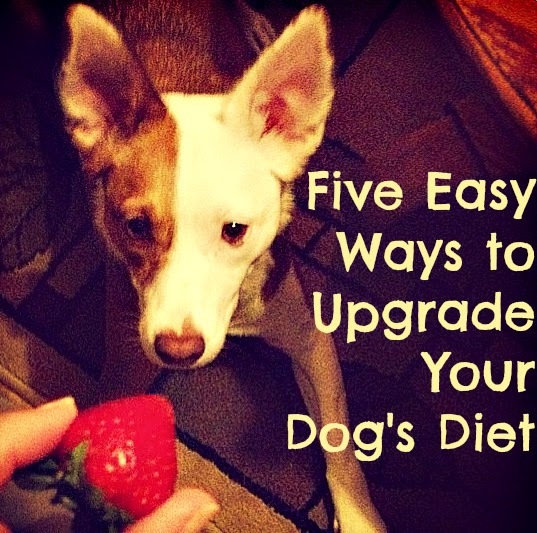 If it is not within your budget to upgrade full-time, try feeding one meal of higher quality (such as a better kibble, canned food, or dehydrated or freeze-dried raw) or using it as a topper. Some brands I love are The Honest Kitchen and Stella & Chewy's. Add fresh or cooked meat and/or cooked or pureed vegetables (broccoli, sweet potatoes, green beans) to kibble meals. I will sometimes add small amounts of fresh fruit to The Ginger Sisters' dehydrated raw breakfast - Ruby loves apples, bananas and strawberries. Add a beneficial supplement such as camelina, coconut or salmon oil. I rotate between all three. Educate yourself and learn how to interpret dog food labels - I highly recommend the book Dog Food Logic. Some formulas may be better than others even within a brand, and depending on your nutrition goals. If you use a rotation diet, watch for coupons and BOGO offers for adding variety and quality or trying something new. Click here to order a $1 sample bundle from The Honest Kitchen (affiliate link). These are awesome tips! I feed a high quality kibble but we still do a bunch of these! I think that dogs appreciate variety as much as we do. I love finding new, healthy things that they enjoy. My dad has been making fruit salad lately and I discovered that The Ginger Sisters both like banana and pineapple! Really great tips, and we're totally on the same page with variety! I just don't think one food all the time could possibly meet every nutritional requirement. In addition to supplementing store-bought food with fresh fruits and veggies, we also use those as treats, which they love! Me too, Maggie! Whenever I cut up some fruit for myself or make a salad, I will set aside some pieces to keep in the fridge for the girls. My dogs fortunately love human vegetables. Or maybe they don't want to hurt my feelings by refusing them. After our dog R was poisoned in the melamine fiasco, we started homecooking for him to help him get back to "normal". It took 18 months before his blood tests came back "normal", and by then, cooking for him was an unbreakable habit. But it's a ton of work for a large dog (plus very expensive since we use grass-fed beef from a local rancher). So, because Shyla doesn't have any medical issues, she eats a high quality kibble with lots of "extras" to make it even healthier (including some of R's homecooked diet). I love your tips - I'll incorporate some of them.